A New York Times best-seller! THE DARK KNIGHT ANDTHE HEROES IN A HALF SHELL COLLIDED IN THE COMICS CROSSOVER EVENT OF THE YEAR!New York City. The Teenage Mutant Ninja Turtles face the battle of a lifetime,fighting both the fearsome Foot Clan and their leader, the Shredder, and thealien forces of General Krang...which is exactly Krang's plan. Now asingle-dimensional warp can rid him of both of his greatest rivals at once. Gotham City. From the Penguin to Killer Croc to Ra's al Ghul and beyond, thecaped crime-fighter called Batman already has his hands full protecting hiscity. Suddenly, a new enemy emerges--the Shredder and his ninja followers,transported to Gotham and unleashed upon an unsuspecting world. Now they're onthe hunt for the technology that will help them return home...and conquer GothamCity in the process, with the help of Batman's deadliest rogues. But heroes comein all shapes, and the Dark Knight does not fight alone. 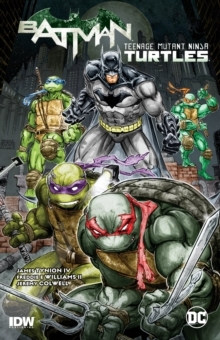 As the Caped Crusaderjoins forces with Leonardo, Donatello, Michelangelo, Raphael and MasterSplinter, can the Bat, the Rat, and the Turtles take down the most viciousvillains from two dimensions? DC Comics and IDW Publishing proudly presentBATMAN/TEENAGE MUTANT NINJA TURTLES written by James Tynion IV (DETECTIVECOMICS) and illustrated by Freddie Williams II (ROBIN) collecting BATMAN/TEENAGEMUTANT NINJA TURTLES #1-6!